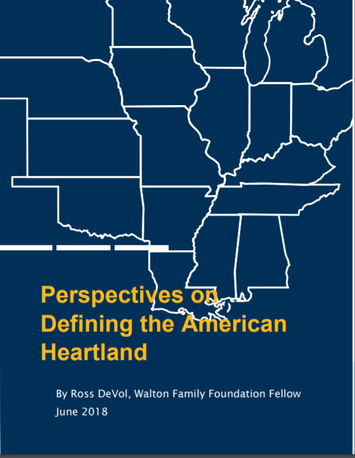 The following excerpt is from a new report, Perspectives on Defining the American Heartland, written by Ross DeVol, a Walton Family Foundation Fellow. Read the full report (PDF) here. George Strait sings about it. Kevin Costner built a baseball field in the middle of it. The Pioneer Woman cooks for it. When one hears “American Heartland”–specific images and cultural values come to mind. With more emphasis on the economy between the coastal regions of the United States, there’s more interest in the American Heartland that goes beyond a country music song, a movie, or a popular cooking show on television. And yet, a widely shared vision of what geographic region truly comprises the American Heartland has so far proved elusive. A recent online poll from The New York Times provided nine different maps of the United States. They then asked their readers to choose the one map that most closely represents their perception of the American Heartland. Many of these maps represented subsections of states. Out of the provided choices, the map with the most responses only managed a meager 22 percent. Some people might see it merely as the middle of the country (Midwest). Others may use the pejorative term, Flyover Country. Most would not include parts of the South. Many would focus on the economic characteristics such as manufacturing (Rust Belt) or agricultural (Breadbasket) dependence. Despite all of the variables, we innately share degrees of ideology and geographic orientation of where the American Heartland is on a map. There is little written analysis attempting to explain the geography of the American Heartland and the emerging term, New American Heartland, in a cohesive manner. This paper explores the origin of the term, Heartland and traces through a series of predecessor terms and how the use of the American Heartland term evolved over time. It concludes with my perspectives on the geographic dimensions of defining the American Heartland. geographic region of the United States in which mainstream values or traditional values predominate.” This context is essential as the geography is deemphasized and ideology becomes more central to the definition.ii The Merriam-Webster definition also implies that some Southern states are part of the Heartland. Further, some writers attach almost a mystical quality to the Heartland, “The Heartland is considered a place we return to when we need to renew ourselves or recommit ourselves to the things that matter.” This quote from Frontiers to Heartland provides a clear perspective of those seeking to enhance the importance of Heartland in the national psyche. Additionally, it suggests that Heartland residents are more stable, cautious and traditional than other parts of the U.S. Many Coastal residents would envision that description as highlighting what traits are holding the Heartland back. RossDeVol is a Walton Fellow at the Walton Family Foundation and is based in Bentonville, Arkansas, focusing on research on policies related to economic vitality in Northwest Arkansas and the American heartland. Ross is the former chief research officer at the Milken Institute, where he was responsible for overseeing research on international, national and subnational growth performance; access to capital and its role in economic growth and job creation; and health-related topics. He was ranked among the “Superstars of Think Tank Scholars” by International Economy magazine.